Meet Rin-Tin-Tin the German Shepherd! 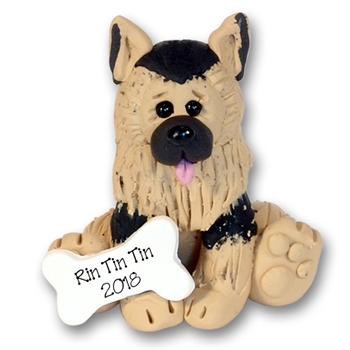 Rin-Tin-Tin is a darling little German Shepherd and one of my favorites. He is hard to resist with his big eyes and cute ears! Handmade from polymer clay by me, it is a limited edition and there are very few available. He is packaged in his own little clear acrylic box with his dog house in the background. All polymer clay ornaments are hand made and may vary from the photograph. Personalization on the ornament is also hand done. Personalization in photo is computer generated.